It&apos;s best not to travel in certain areas of waterlogged Wisconsin , but if you must travel, bring your patience and a map! Flood waters continue to effect the main roadways in our state. "We have had to close major portions of the Interstate system." 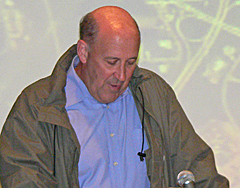 Governor Jim Doyle toured the flooded areas of the Badger State and met with emergency officials. He says the area where I-39 and I-94 come together in the Wisconsin Dells area is flooded, causing those roadways to remain closed. "So that whole area is largely under water and the traffic through that part of the state has … well there isn&apos;t any traffic in that part of the state. Those roads have been closed." Also, much of I-94 westbound from Milwaukee to Madison is closed. Michael Goetzman, with Wisconsin Emergency Management , says due to excessive flooding and strain, motorists are being detoured away from the detoured roads! "Because of rising waters along County Highway B we have to stop using that as a detour. We can&apos;t use Highway 18 because Highway 18 over the Crawfish River is also closed due to flooding." So, he says, the new route is really out of the way. For example, trucks going from Milwaukee to Madison will first be directed down south to Beloit, and then back up to Madison, adding hours to the trip. Regular motorists, Goetzman says, can try smaller back roads, but there are no guarantees, as hundreds of city and state roads are also closed, and it will tack on a lot of time to your trip. As for the Interstates, when will they be reopened? Goetzman answers, "If you can tell me when the waters will subside I can give you that answer. But right now we don&apos;t know." Updated (06/14/08) : Wisconsin Emergency Management officials say travelers are urged to follow official detours and not find their own routes due to many locations where roads are affected by flooding. There are reports of traffic back-ups in many locations due to the normal volume of weekend travelers now having to drive on these detoured routes.